Recently, it was reported that millions of eggs contaminated with the insecticide fipronil had been distributed to more than 17 countries. On July 20th 2017, it was made public that in some cases the pesticide fipronil was mixed with another formulation and sprayed on chickens as a treatment against ticks, fleas and lice. 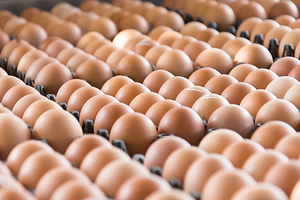 As the determined levels were in some cases significantly higher (between 0.0031 and 1.2 mg/kg) than currently valid EU MRL of 0.005 mg/kg for the sum of fipronil and fipronil sulfone there is a demand for quick and efficient methods for the determination of both substances in egg matrix or, potentially, in chicken meat. Separation Science, in collaboration with Thermo Fisher Scientific, has developed a webinar that will describe a quick and simple method is presented for the determination of fipronil and fipronil sulfone in eggs using a modified QuEChERS acetonitrile extraction protocol, followed by LC-MS/MS or GC-MS/MS determination. The presentation, given by Michal Godula (Thermo Fisher Scientific), covers a complete solution from the egg to the result. A cheap, fast and simple sample preparation method has been developed. The extract is amenable to GC as well as LC. This presentation will show in detail method performance parameters, including recoveries, linearity, repeatability and detection limits achieved by LC-MS/MS and GC-MS/MS.